1 Process avocado, Hellmann's® or Best Foods® Real Mayonnaise, jalapeno peppers, lime juice and water in blender or food processor, adding additional water if needed, until smooth; set aside. 2 Heat oil in large nonstick skillet over medium-high heat and brown chicken. Remove chicken from skillet. 3 Cook onion and red pepper in same skillet, stirring occasionally, until vegetables are crisp-tender, about 5 minutes. Return chicken to skillet, then stir in chili powder. Cook, stirring occasionally, until chicken is thoroughly cooked and vegetables are tender, about 5 minutes. Stir in cilantro. 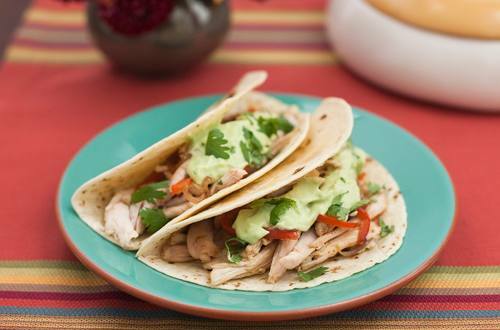 4 Evenly arrange chicken mixture down center of each tortilla, then drizzle with Creamy Avocado Sauce; roll-up.